Any medicine can cause an allergic reaction. An acute urticaria can occur within a few minutes to a few hours after taking some medicine. The symptoms of an allergy to medicine can be: an urticaria, a rhinitis, asthma, angio-oedema and sometimes even anaphylactic shock. In the large majority of the cases, allergy to medication occurs 12 to 24 hours after taking the medication: penicillin, aspirin, non steroidal anti-inflammatories, morphine, iodine contrast products, anaesthetics and antibiotics can be the cause. The allergic symptoms rarely occur less than two hours after the first intake of the medication: penicillin, anaesthetics, iodine contrast products for instance. The reactions observed are sometimes violent and can even lead to anaphylactic shock. Allergic reactions to a medication can also appear several days, even several weeks after discontinuing a drug. Symptoms may suddenly appear with medicine which has often been prescribed for several months or even for several years. Consult a doctor and stop taking the specific medicine as well as any other products belonging to the same family. Depending on the drug allergy, the symptoms and where the allergic reaction happened an allergic assessment may be required. : it is carried out generally under medical supervision i.e. in hospital. 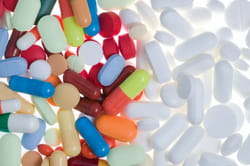 Oral medicine reintroduction tests: the aim is to try to give the medicine again and observe the appearance of symptoms. These tests are carried out under medical supervision. Usually the removal of the suspected medicine even if the tests are negative. If the concerned medicine is essential, and if the oral reintroduction test is successful, it is advisable to continue. But the risks will always exist and it is essential to inform the patient about them. Do not re-use a suspect medicine. Always carry a card on which is written the medication to which you are allergic. Any medicine, even when considered harmless and often taken for several months, can cause allergic symptoms. Symptoms caused by allergies to anaesthetic medication can cause moderate and sometimes severe reactions. Antibiotics, morphine and certain drip products are also concerned. Any person having had an allergic reaction during an anaesthesia must have an allergy assessment during the few weeks following the intervention. Any person who has suffered an allergic incident during a surgical operation must consult a specialist in anaesthesia allergy. Latest update on December 20, 2010 at 05:30 AM by Janey39. This document, titled "Allergy to medicine," is available under the Creative Commons license. Any copy, reuse, or modification of the content should be sufficiently credited to CCM Health (health.ccm.net).